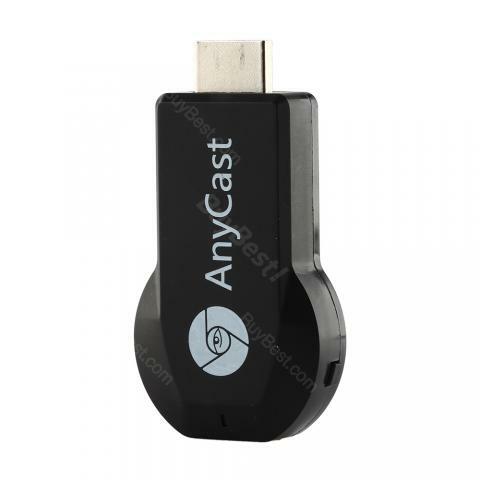 AnyCast M2 Plus WiFi Display Receiver is a special device to protect your smart phones / tablet PC to another big screen devices with HDMI interface (such as, HDTV, Monitor & Projector, etc) through WiFi connection. • Wireless display: cast your contents (Video, Game, Audio, Picture, App and File) in your Smart Phones / Tablet PC to another big screen devices with HDMI interface (such as, HDTV, Monitor & Projector, etc) by using Miracast, DLNA and AirPlay through WiFi connection. • Easy operation, plug and play.Only 3 steps to enjoy the media on large screen: Plug->Connect->Mirroring. • High-performance wireless transmission. Built-in Wi-Fi module supports 2.4GHz WiFi, supporting Online & Local content wireless display: Video / Audio / Photo / Office file / Website. Also can be used a Car WiFi Display and a great Travel Partner, just connect M2 Plus (powered by 5V/1A) to Car HDMI port, transmitting multimedia contents of Smart Phones to the car monitor. • High definition output. HDMI port (HDMI1.2) support 1080P video output and High-quality Sound Effect output. • Widely use & compact portable design. Supports E-learning, business meeting, education presentation. It works as good as I could hope for, for $18. I admit it was little discouraging at first since my device wasnt showing a wifi network however i learned from tinkering with it (since there was a lack of instructions) that there is a button on the device which changes mode. I think switch it to airplay and set it up and connected to my wifi network. From there it updated itself and visually showed improvement in terms of sharpness. Love it! Works great with my iPhone and iPad. I watch soccer games with this. Easy set up. Hit the mirror option on iPhone or iPad, choose the anycast option and it’s on the tv. Liked the product very much. Was using my old HDMI before. It has a switch which easily turns the device discoverable from Apple to android device. If you download streaming software then I guess it can be used for any device. Works well and connects easily. I bought this to my HDMI TV now I can display movies from my smart phone straight to my HDMI TV wirelessly.